Japanese Episode 269: "Kesshou Toonamento! Furu Batoru 6 vs 6!!" English Episode 607: "The Ties that Bind"
The battle between Satoshi and Shigeru is nigh, but before that there is a day off for all contestants. Satoshi spends his day researching Shigeru's pokemon, trying his very best to choose the best pokemon to battle his longtime rival with. While eating breakfast, Satoshi's Lizardon flies in from out of nowhere, giving Satoshi yet another pokemon to choose for his big showdown! The day of the competition comes, and it is revealed that the finals tournament is a six-on-six battle in a stadium that's constantly shifting among four different fields; grass, rock, water, or ice. The first battle pits Hazuki against an unnamed trainer, and the trainer from Mishiro Town wins. 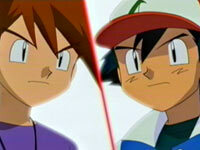 After that is the big battle--Satoshi vs. Shigeru! Shigeru chooses a Nidoqueen while Satoshi chooses his Kentaros, but Satoshi's pokemon's reckless attacks causes its downfall. Satoshi decides to use Heracross next, so Shigeru decides to substitute his Nidoqueen with a Boober. The fire-type hits Satoshi's pokemon with a barrage of fire-type attacks, but Satoshi's Heracross is able to withstand them long enough to K.O. the fire-type with a Mega Horn attack. Shigeru's next pokemon choice is a surprise to everyone--it's Kamex! It is revealed that Zenigame was Shigeru's starter pokemon, and that it had evolved into the super-powerful Kamex! Can Satoshi's pokemon withstand the attacks of Shigeru's most powerful pokemon? To be continued! The Jouto League begins in earnest with the beginning of the finals, and with it we get to see one of the most anticipated battles of the entire series--Satoshi vs. Shigeru. The battle between the two long-time rivals is probably the most exciting battle of the league, and now that Lizardon's in the picture, you know things are going to get interesting. While I think Satoshi's victory against Shigeru's Boober is complete bullcrap, the rest of the battle starts off on the right foot. Unfortunately, the dub dampens the most important part of this episode (which I'll get on to at the end of this comparison). And it seems like we have a lot more time cuts than usual, which doesn't make sense to me since the episode doesn't seem any longer than any of the other episodes. Two seconds are trimmed from the opening pan shot. When Satoshi is looking for his half of the Monster Ball Shigeru and he broke those years ago, there's a second cut from the establishing shot of the building the trainers are sleeping in. Then, in the following shot of the room with all of Satoshi's belongings all over the floor, two seconds are cut. The pan shot before the Rocket-Dan's first scene in the episode is shortened by two seconds. Misty: "Have you been online all night?" Originally, Satoshi didn't stay up all night. He tells Kasumi that he woke up at 5:00am because he was too excited about his upcoming battle to sleep. He doesn't pull an all-nighter the way Ash does. Brock: "And since he doesn't prefer one particular pokemon over another, it'll be a different story than battling someone like Misty with all one type. So putting your team together is crucial." He gives the same advice in the Japanese version, but Kasumi and her water pokemon isn't the only example he comes up with. He also uses Moé (Macey) and her fire-type pokemon as an example of a trainer who favors one type of pokemon. There are two possible reasons for this change--either there weren't enough mouth flaps for 4Kids to fit Macey's name into the conversation, or 4Kids purposely left her out in order to focus on Misty more. Personally, I think it's a little bit of both. When Satoshi looks up in the sky and notices Lizardon coming, a second is cut from the shot of the sky. We see Satoshi look shocked, and then, in the next shot of Lizardon flying closer, another second is cut. A lot of short cuts are made during the opening of the Johto League finals, during the part when the announcer's "The day of the Johto League Silver Conference Victory Tournament has finally arrived! It's been an arduous journey..." spiel. Two seconds are cut from the shot of the sky, a second is cut from the bird's-eye-view of the stadium, two seconds are cut from the shot of the head of the League, zero seconds are cut from the crowd scene (by the way, doesn't Jun'ichi look absolutely pissed off in this shot? ), a second is cut from the close-up of the stadium, and two seconds are cut from the pan of the scoreboard. Scenes with cuts like these are part of the reason 4Kids doesn't keep all of the original music in the show. Two seconds are trimmed from the pan of the locker room where Satoshi congratulates Hazuki on his victory. Two seconds are cut from a shot of Satoshi ("Fasten your seatbelts! This battle is about to begin!") right before the start of the battle. Announcer: "Magmar is hit by the most powerful pokemon attack!" No, Mega Horn is not the most powerful attack. In the Japanese version, the announcer states that Heracross used the most powerful BUG-TYPE attack. Misty: "Brock! Could that be...?" Brock: "The same Squirtle that Gary originally received from Professor Oak? Yeah, that's the one." Remember way back in the first episode, when Satoshi asks Shigeru what pokemon he got from Orchid-Hakase? Shigeru refused to tell him, and for 269 episodes, neither Satoshi, any of his traveling companions, nor any of us knew which pokemon Shigeru got from his grandfather. With this episode, however, we all find out at the same time. That's where the problem is. In the dub, Brock acts as if he knew all along, and the tone of his voice seems to say that it's common knowledge that Gary's starter pokemon was a Squirtle. In the Japanese version, Kasumi asks how he got one, and Takeshi wonders if the Kamex Shigeru has could be a Zenigame that he got from Orchid-Hakase. He doesn't just sort of know the way he does in the dub, and his ignorance in the Japanese version makes the revelation of Shigeru's starter pokemon that much more special. So thank you, 4Kids, for ruining one of the big revelations of the end of the series. Two seconds are cut from the TO BE CONTINUED screen.